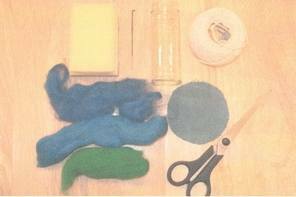 How to Make a Needle Holder for Your Felting Needles. You will also need scissors, a cup of warm water, soap, a small towel and a piece of see through or thin fabric such as voile/cotton/netting (a piece large enough to cover the whole jar). 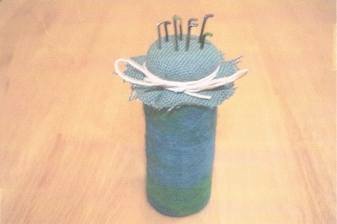 Cut a round piece from the loose woven fabric, big enough to cover the top of the jar and be tied on with the string. Wrap the jar in the voile and hold in your hand and then rub a bar of soap over the voile and jar (or use washing up liquid) then rub up and down all sides of the jar with your free hand for about 30 seconds. Turn jar on to the open end and cover the bottom with wool, this should over lap the sides which already have wool on them. Cover the bottom with the voile, soap the end, and rub for 30 seconds. 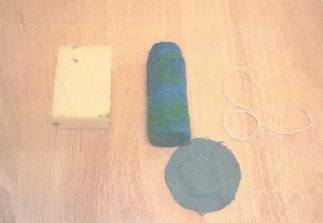 The jar should be covered with the wet semi felted wool. Wrap in the voile, rub on more soap (if needed) and rub all the sides and bottom for about 1 or 2 minutes. Remove the voile and continue to rub the sides and end with your hands until the wool is firm and stays in place. Stuff the sponge in to the jar. Cover the top of the jar with the fabric, tie your string in a loop, place the loop over the fabric and around the neck of the jar, tighten, loop around neck again and knot off. Cut off any excess. Push you needles through fabric and into the sponge below. Done!